Affected by lower international prices and disease in some leading producing countries, global production of farmed shrimp in 2016 is likely to have remained stagnant at the 2015 level, if not lower. Overall, import trends remained moderate during the first nine months of 2016. The main season for farmed shrimp in Asia ended in November 2016 in most of the producing countries, with an overall sluggish trend in production. This went against the earlier forecast of increased production in 2016. Preliminary reports of 2016 production data for farmed shrimp suggest that recovery in Thailand and strong harvests in Ecuador were not enough to offset the falling production of farmed shrimp in China and Viet Nam due to persistent shrimp disease and related issues. The average per hectare harvest in Viet Nam reportedly declined by 50 percent due to poor quality shrimp fry and slow growth. Due to production issues, both China and Viet Nam had to import large quantities of shrimp for reprocessing and export. Overall 2016 production in India and Indonesia, the two other large producers of farmed shrimp in Asia, is expected to be lower than the early 2016 forecast. In Latin America, farmed shrimp production increased moderately in Ecuador, but in Mexico disease and premature harvests negatively impacted volume growth. Farmed shrimp supplies also did not improve in other countries in the Central and South American region. In terms of wild-caught fish, Argentina had another record year of catches of Pleoticus muelleri in 2016, with annual landings expected to exceed 150 000 tonnes compared with 140 000 tonnes in 2015. In contrast, in the USA, landings from the Gulf of Mexico declined by 18 percent during January–October 2016 (36 000 tonnes) compared with the same period in 2015, keeping ex-warehouse prices strong at higher levels compared with imported vannamei shrimp. Even with lower than expected growth in shrimp aquaculture, India moved to the leading exporter in international shrimp trade during the first nine months of 2016, followed by Ecuador, Thailand, Indonesia and China. Compared with the same period in 2015, exports from India increased by 11.6 percent, totaling 315 400 tonnes. Ecuador also increased exports by 7.5 percent (276 000 tonnes) during this period with increased sales to East Asia, the Russian Federation and Latin America. Improved farmed shrimp production in Thailand facilitated a 28 percent rise in exports to 150 000 tonnes during the review period and secured the country its third position in the global shrimp export market. More than 40 percent of these exports consisted of processed/value-added products. With two digit rises in Chinese export volumes to the Republic of Korea (+17.25 percent), Hong Kong SAR (+18.90 percent) and Taiwan Province of China (+18.32 percent), total Chinese exports of shrimp increased by 9 percent to total 136 000 tonnes. Shrimp export volumes from Viet Nam posted growth in the USA (+10 percent), Japan (+5.5 percent), EU (+12 percent) and other East Asian markets during January– September 2016 compared with the same period in 2015. In terms of prices, generally shrimp prices remained soft in global export trade during the review period, dominated by vannamei shrimp. However, exporters of black tiger (Bangladesh, Myanmar and Indonesia) reported firmer price trends following strong demand from the USA and Japan. Supplies of this species have tapered over the years from India, Viet Nam and Indonesia. Among the top three traditional markets, shrimp demand has improved in the USA and in Japan in 2016, especially during the summer and school holiday seasons. This good demand has been supported by the lower import prices. In the European markets, consumer demand has remained flat. During the review period, shrimp imports increased by 3.5 percent into the USA, by 5 percent into Japan and by 3.4 percent into the EU compared with the same time in 2015. High inventories are reported with European importers and distributors due to slow summer demand from end consumers. There were lower imports to Norway (-22 percent) and Switzerland (-10 percent). In contrast, strong import growth persisted in the Russian Federation (+44 percent) following the lifting of the food embargo, though this volume remains below January-September 2014 imports of 37 000 tonnes. During the reporting period, Vietnamese imports of raw frozen shrimp, mostly meant for re-exports, exceeded 200 000 tonnes with an estimated value of almost US$1 billion. Both retail and catering demand for shrimp improved in Japan during 2016, as the product group remains more affordable to consumers compared with other seafood such as tuna, salmon, white meat marine fish and cuttlefish. In general, market demand for the high-end market segment of head-on sea-tiger and farmed, black tiger shrimp improved; sales of semi-processed, peeled, tail-on shrimp (nobashi) and processed shrimp also increased during the 2016 reporting period compared with 2015. For the first time since 2013, Japanese total shrimp imports increased during January–September 2016 reaching nearly 155 000 tonnes. Viet Nam, Thailand, India, Indonesia and China were the top five exporters. In this total, 27 percent consisted of processed/value-added products such as cooked and peeled shrimp, ready-to-cook tempura shrimp, sushi shrimp and other types of shrimp-based products. Raw, frozen, shell-on and PTO shrimp also followed the same import pattern supported by good demand from supermarkets and domestic processors of tempura shrimp. Shrimp remains US consumers' top choice for seafood. Lower import prices, which trickled down to the consumer level by mid-2016, and increased disposable income created this needed rise in US demand. Sales increased in the retail and catering trade, thus reducing domestic inventories. As the single largest shrimp importer, the USA continues to influence international shrimp trade. Import volumes into the market increased by 3.4 percent during January–September 2016 against the same period in 2015 with a value rise of 1.3 percent to total US$4 billion. During this period, the average import price was 2 percent lower than the same period a year ago. There were increased imports of raw, shell-on and peeled shrimp but lesser volumes for processed products (breaded shrimp and other preparations). Processed products comprised 20 percent of US shrimp imports. In total imports, India replaced Indonesia as the leading supplier to the USA followed by Ecuador, Thailand and Viet Nam. There was a significant rise in exports from Thailand (+16 percent). Supplies from Ecuador continued to be lower (-17 percent) to the US market as Ecuador has been increasingly targeting non-traditional markets. Demand for black tiger shrimp also increased during the reported period; imports increased from Bangladesh by almost 55 percent to 2 600 tonnes. In general, the price softening of shrimp supports higher imports. However, European consumers have been conservative in their spending due to the financial difficulties in the EU economy. The 5.3 percent growth rate in EU shrimp imports from extra-EU countries during January–June 2016 narrowed to 3 percent during January–September 2016 to total 410 500 tonnes. Supplies from extra-EU sources were close to 74 percent of total shrimp imports into the EU during the period. Interestingly, imports of the cheaper, cold-water shrimp from Argentina and Greenland were higher by 17 percent and 21 percent respectively. Tropical shrimp imports grew from Ecuador (+0.27 percent), India (+4 percent) and Viet Nam (+11.7 percent). 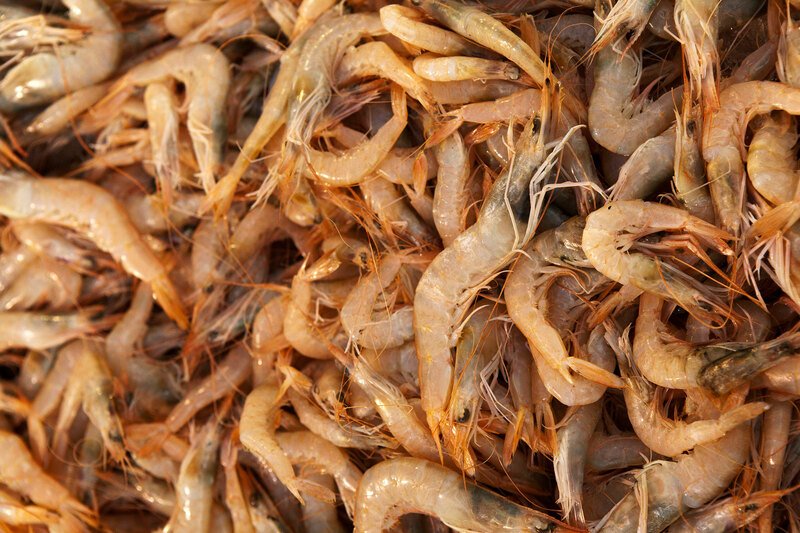 Imports from Bangladesh, generally consisting of wild-caught white and brown shrimp and farmed black tiger, declined due to price competition with cheaper vannamei shrimp. Among the top five single markets in the EU, Spain imported 112 600 tonnes (+2 percent), France 81 200 tonnes (+3.9 percent), Denmark 61 000 (+7.4 percent), and the UK 57 800 tonnes (+7.36 percent) during the first nine months of 2016 compared with the corresponding period in 2015. There was a 4.5 percent rise in intra–EU trading (exports), a large proportion of which originally came from extra-EU countries. In the Russian Federation, shrimp imports increased significantly totaling more than 21 000 tonnes (+44 percent) with large increases in supplies from India (+66 percent) and Ecuador (+ 97 percent). Viet Nam continues to be an attractive market for Asian and Latin American shrimp exporters. Vietnamese shrimp imports during the first nine months of 2016 exceeded 200 000 tonnes, largely supplied by Ecuador (118 000 tonnes) and India (68 700 tonnes). 76 300 tonnes of shrimp were imported into China during January–September 2016, which is 14 percent higher than the same time period in 2015. However, there were reduced imports from Canada, Ecuador and India. The top Chinese suppliers were Argentina (20 700 tonnes), Canada (14 800 tonnes), Ecuador (11 200 tonnes) and Thailand (8 000 tonnes). Due to the weaker Chinese currency against the US dollar and high tariffs on imported shrimp for domestic consumption, direct imports declined from Ecuador (-26 percent) and India (-17 percent). Imports from Viet Nam through border trade remained strong for the same reasons. In the Republic of Korea, shrimp imports increased by 17 percent, totalling 3 500 tonnes. In Hong Kong SAR imports increased by 11.9 percent (38 600 tonnes) and in Singapore by 6.6 percent (18 000 tonnes). Imports to Taiwan Province of China were marginally lower (-1 percent) to total 24 500 tonnes. In the Pacific, imports increased into Australia (+3 percent) to total 21 400 tonnes and in New Zealand by 12 percent (3 200 tonnes) during the reporting period.